U.S. stocks declined the final week of the year, paring the best annual gain in four years, as investors cautiously positioned their portfolios ahead of the extended New Year’s weekend. Selling erased earlier gains with most of the losses occurring during Friday’s final 15 minutes of the trading year. Overall, share volume was 28% lower than the 30-day average, but had been down as much as 45% earlier in the week. With no major economic data scheduled for release on Friday, investors had turned their attention to growing speculation that the Trump administration will now move toward passing a $1 trillion infrastructure-spending bill. The S&P 500 advanced 21.83% in 2017, including dividends. For the week, the S&P 500 slipped -0.33%, the Dow Industrials declined -0.14% and the MSCI EAFE (developed international) rose +0.94%. Chart 1 illustrates that housing prices accelerated at their fastest pace in over three years in October, rising 6.4% year-over-year, narrowly higher than September’s 6.2% increase, according to the S&P/Case-Shiller 20-City Composite Index. Housing prices continue to benefit from low mortgage rates, limited supply, high consumer confidence and strong economic growth. The three cities with the fastest rate of growth over the last 12 months are Seattle (12.7%), Las Vegas (10.2%), and San Diego (8.1%). Washington D.C. registered a 3.1% year-over-year rise in home prices, which was the lowest among the 20 cities in the composite. Looking ahead, national housing prices are likely to rise at a solid pace in 2018 because of constrained supply, strong demand from millennials, and elevated consumer sentiment. However, headwinds do exist, especially in high cost areas. The Republican tax bill that goes into effect in 2018 limits the amount of state and local taxes that can be deducted from federal taxes to $10,000, and lowers mortgage interest deductibility from $1 million to $750,000. Mortgage rates are likely to increase if the Federal Reserve increases the pace of interest rate hikes, which may slow the pace of housing price increases. 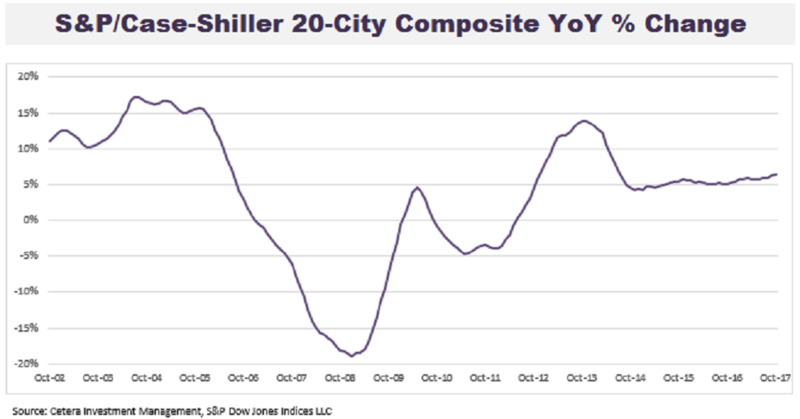 The S&P/Case-Shiller 20-City Composite Index tracks housing prices in 20 major U.S. metropolitan regions.